Chasing Roots: "Good Morning Lincoln!" My sis-in-law, Jenna, works as a radio personality for Froggy98 in Lincoln, Nebraska. 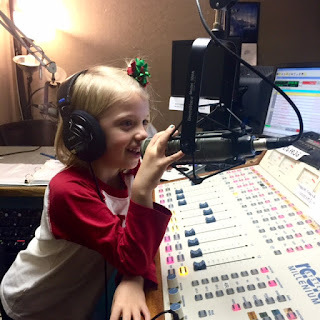 As a member of the morning show team, Jenna's relatable voice and infectious laugh hit the airwaves live every weekday from 6am until 9am, and she also hosts her own program on Sunday afternoons. Portions of Jenna's Sunday show can be prerecorded, and when she decided to go that route for the show that would air during our visit, she invited me, Hallie, and our friend Kelsey to join her in the studio. When Jenna suggested to Hallie ahead of time that she might enjoy hearing her own voice on the radio, Hallie agreed. I worried, however, that when face-to-face with an actual microphone, Hallie might either use the muffled, babyish voice she tends toward when put on the spot, or worse, refuse to speak at all. I needn't have worried. Yes, she seemed nervous at first, but when the recording light went on, Hallie blew us away with her perfectly-crafted radio voice. It rang out crystal clear, beautifully highlighting both her confidence and the fact that she was/is still just a little girl, and made me wonder if she'd secretly been practicing for weeks. Hallie had to read song titles and artist names off of cue cards because she wasn't familiar with the majority of the music, but she eventually nailed absolutely everything Jenna asked her to say…and sing. The girl who once told me, "I like to dance, Mama, but I LOVE the stage" might have found herself a new stage on which to shine. Thank you to everyone who tuned in when the show aired on December 27th! Jenna and Hallie gave a little shout-out to our Texas "roots" while on the air, so I hope our Texas listeners caught that moment!